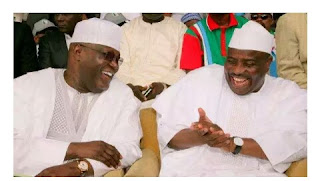 Aminu Tambuwal, governor of Sokoto state, visited former Vice-President Atiku Abubakar in Abuja on Sunday night. Both politicians defected from the ruling All Progressives Congress (APC) to the Peoples Democratic Party (PDP) and there are reports that they are nursing presidential ambition. Tambuwal also held a meeting with Gbenga Daniel, director-general of Atiku Presidential Campaign Organisation. The reason for his visit and details of the meetings were not known. Although Paul Ibe, spokesman of the former vice-president, confirmed Tambuwal’s visit to his principal, he did not go into details. Rabiu Kwankwaso, ex-governor of Kano, visited Abubakar in June. He has also been reported to be interested in the presidential ticket of the PDP. Kwankwaso, who is a serving senator, was also a member of the APC.